Ruger has sold more than 6 million 10/22 rifles since their launch half a century ago. Some estimates peg the number much closer to the 10 million mark. That is a fitting testament to the enduring popularity of the Ruger 10/22 among gun connoisseurs in America. There is nothing to dislike about the Ruger 10/22. In a country where bigger is almost always considered better, the Ruger 10/22 has managed to hold its own thanks to their ease of use, accessibility and practicality. And did we forget to mention the sheer fun quotient? The 10/22 is a fantastic rifle for beginners and experienced shooters alike. At just over 5 pounds, it is a compact rifle that is easy to carry and shoot. Unlike its other .22 caliber peers, the Ruger can be fired with minimal effort from a rested position or even off hand, thanks to the absence of box magazines. And since it is a rimfire rifle, cartridges are cheaper, simpler to handle and cause minimal recoil. This is a rifle that you would want to take regularly to the local shooting range for fun. With a weaker .22 projectile, smaller game is all you can reliably take down with the Ruger 10/22. It is however a fun rifle to use, and sturdy and dependable to boot! Let’s be honest, you don’t have to put optics on the 10/22 to get your fix of fun out of it. After all, we are talking about a rifle with a flat range somewhere in the vicinity of 125 yards. But a scope is always a great addition to a rifle. And since this is a low powered rimfire rifle, you don’t have to break the bank looking for a scope capable of taking a lot of punishment and recoil effects. Thanks to the enduring popularity of the Ruger 10/22, there are some great affordable optics available for the rifle in the market. With the 10/22, you are looking usually looking for tight patterns at around the 100-125 yard mark at the shooting range. At $35, the Simmons scope is a marked improvement on the iron sights of your .22 rifle. The scope has a run of the mill 32mm lens, which is standard for this range of scopes. The 9x magnification is more than adequate for the modest range of the .22 caliber rounds you will be firing from the plinker. With this kind of rifle, you really should be looking only at scopes designed specifically for rimfire shooting and this is an affordable scope of excellent quality that should get the job done in the target range for you on a regular basis. At 9.6 ounces, it is perfect addition to your 5 pound rifle. Retailing at rates identical to the Simmons scope above, the Tasco is another decent option for .22 Ruger owners. This is a scope that is tailor-made for a .22 rimfire rifle. At around 11 ounces it is a quite lightweight scope that should get the job done on a Ruger 10/22. With a standard 32mm objective lens, 9x magnification, waterproof and fog-proof construction, it has all the features you would expect from a scope in its class. This multipurpose scope will serve you adequately whether you want to do some varmint hunting or fire a couple of rounds at paper. Nikon offers some of the finest quality glass at affordable prices. Within our shortlist of scopes for 10/22 Rugers, the Nikon is one of the two premier options. This scope has been designed specifically for rimfire rifles like the 10/22. While it is not exactly cheap at over $150, this Nikon scope will deliver top notch performance for Ruger 10/22 owners looking to do some serious target shooting at the range. The BDC reticle offers a unique feature of open circle aiming points at distances between 50 to 150 yards, making it a perfect addition to a .22 Ruger. This is not the most lightweight scope in our list,but that is a small tradeoff, considering the amazing optics and unbeatable build quality. For anybody looking for the best performance from a .22 plinker at the competition level, the Nikon is scope of choice along with the next scope in our list. The Leupold name needs no introduction here. This is the most expensive scope for a 10/22 Ruger in our list. At $220, it might sound a bit of an overkill, but this is the best scopes in its class. It is very compact and lightweight at 8.2 ounces, and has all the hallmarks of the legendary Leupold build quality. Unlike most other cheaper options in this list, you also get full lifetime warranty and that is a sweet deal right there. With excellent light transmission, this scope will serve you well in low light conditions you might encounter out ion the woods. The 7x magnification is more than enough for the range capabilities of the .22 Ruger. The 10/22 is not really a serious hunting rifle, but for those looking to improve their chances against smaller game or varmints, this Leupold is the perfect choice, albeit a pricey one. If you have the money to spend, this Leupold is probably the best your can buy for a Ruger 10/22 rifle right now. Available at around the $50 mark, this is another good option specifically designed for .22 plinkers like the Ruger 10/22. The optics may not be up to the mark of a Nikon or Leupold, but that is out of the question at this price point anyways. This BSA is an excellent scope in its own right for the price. Once you zero it at 50 yards, your should be good for up to 150 yards or more. Not exactly the lightest scope in business at 20 ounces, the BSA is nevertheless a capable scope for those looking at an affordable option to go varmint hunting with their .22 Rugers. At around $40, this another decently priced and specced rimfire scope option suitable for the 10/22 Ruger rifle. 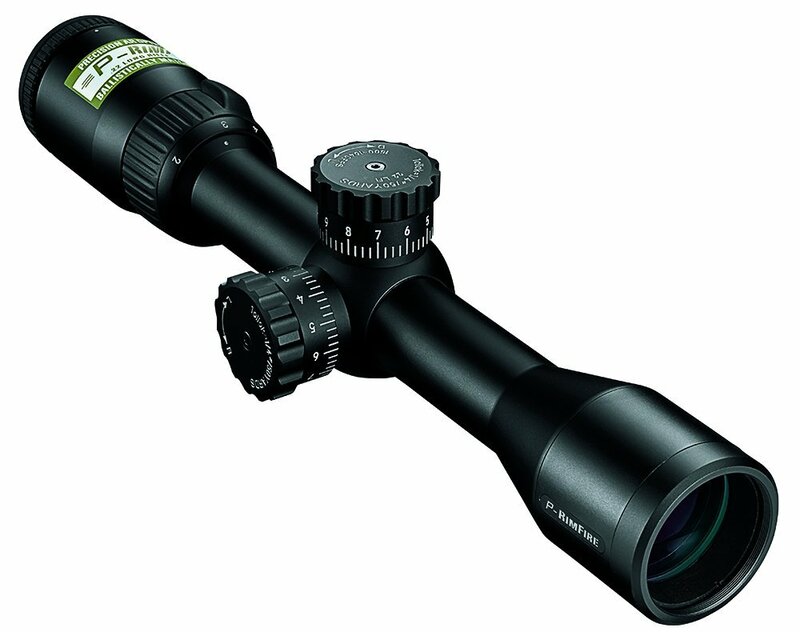 Though definitely not something that you might want to consider for competition level shooting, this scope is a good buy if you intend to hunt small game or go after a few beer cans at 50-100 yards. The optics are crisp for the price and the build quality is rugged enough to handle most outdoors conditions. It is also a decent scope for routine target practice, especially for beginners looking to familiarize themselves with an entry level gun like the 10/22. The 10/22 is a much beloved and capable gun, no question about that. Though not exactly a gun that begs for a scope, adding some quality glass to the rifle will undoubtedly improve its shooting capabilities. There are a few things owners of the Ruger should keep in mind while thinking about getting a scope for their rifle. Conventional wisdom holds that money spent on quality optics is never wasted. But the .22 Ruger is a small caliber rifle that performs well within a limited range. Mounting a regular centrefire scope on this kind of rifle is certifiable overkill. Ruger plinkers are best used in conjunction with scopes that are designed specifically for rimfire rifles. And looking at the range of choices available in the market, ideal scopes for the 10/22 all share 3 basic characteristics. They are not the most expensively priced scopes out there. Even the more expensive Leupold and Nikon models are priced well under the $250 mark. If you are into serious target shooting or small game hunting, these are your go to scopes for this rifle. For a more casual use, any of the other scopes under $100 will more than enough. The 10/22 is a light rifle and the best scopes designed for these rifles tend to weight around 10 ounces. The Nikon and BSA tip the scales around 16-20 ounces mark, but that shouldn’t really be a deal-breaker. It is up to the individual user to figure their personal preferences. And you will not find scopes with too many feature in the .22 class. And there is a sensible reason for that. Though the 10/22 Ruger is an excellent rifle adored by expert marksmen as well as your average Joe, it is mainly considered a beginners weapon for those looking for an entry point into the world of rifles. As such, you really shouldn’t be looking for scopes with an overwhelming array of features, most of which may not even work on the modestly performing .22 plinker. In conclusion, 10/22 Ruger owners looking for best in class scopes designed for serious target practice should look at the Nikon and Leupold scopes. If budget is an issue, you have plenty of choice in the sub $100 range with the scopes we have shortlisted for you here.